As the NBA prepares for a summer that promises to see money thrown around at a record clip, we’re left wondering how some of the biggest contracts in recent Association history have worked out. From the devastating injury Gordon Hayward suffered at the start of last season to multiple members of the Cleveland Cavaliers and Minnesota Timberwolves, here’s a look at the 10 worst value contracts around the NBA right now. Much like other players in this article, Boston could not have foreseen the devastating leg injury Hayward suffered in his first game with the team. It cost the now 29-year-old Hayward his entire initial season in Boston. Given that the Celtics signed him to a max contract, that was a bitter pill to swallow. The good news here is that Hayward has somewhat returned to form in recent weeks. He’s averaging 12.1 points on 54 percent shooting from the field over the past 12 games. The bad news? Hayward has been sidelined since suffering a concussion back on March 16. Embattled Grizzlies general manager Chris Wallace couldn’t have foreseen Conley’s injury issues when the team made him what was the highest-paid player in Association history back in 2016. Even then, Conley’s body of work never translated to such a rich contract. Prior to signing the deal, this former No. 4 overall pick had not earned a single All-Star Game appearance. He was also 28 years old at the time — a clear indication that the veteran had already hit his peak. Three years later and after missing 70-plus games to injury, Conley is an albatross in Memphis. That’s magnified by the fact that Wallace and Co. unsuccessfully attempted to trade him back in February. We have to give the Wizards and general manager Ernie Grunfeld credit for getting out of Porter’s contract at the trade deadline. In return, they picked up Bobby Portis and the expiring contract of Jabari Parker. That’s a rare win for this front office. While Porter still offers a lot of upside for a rebuilding Bulls squad, 25-year-old forward has never come close to living up to the deal he signed in D.C. back in July of 2017. Paying out $26.33 million annually to a guy averaging less than 14 points per game this season is just atrocious. We fully get that Minnesota wants to build around Karl-Anthony Towns and Wiggins. Unfortunately, Towns is the only one of the team that’s a true building block for this long-downtrodden organization. Issues had previously arose on the defensive side of the ball. Now, 24 years old, Wiggins has been far less effective on offense. That has to be concerning to the Wolves’ brass. Thus far this season, the former No. 1 overall pick is averaging just 17.5 points on an absurdly low 40 percent shooting. Those aren’t even pedestrian numbers. They are bad. Given Wiggins is locked in at $36.93 million annually through the 2022-23 campaign, this has to be seen as one of the worst contracts in all of professional sports. Even after seeing LeBron James break up this championship-caliber team this past summer, Cleveland thought it made sense to retain a then 29-year-old Love on a max contract. How in the world did that fit into the Cavaliers’ rebuild? It didn’t. Instead, the team had a false notion that it could contend for a playoff spot. Almost immediately, this became a running joke. After playing in the first four games of the season (all losses), Love suffered a toe injury that cost him the next 50 outings. While Love has played well, he doesn’t fit into Cleveland’s long-term rebuild plans. One of many Chris Wallace’s mistakes coming home to roost big time. Honestly, we still have no idea how the GM is still employed by Memphis. It was back in July of 2016 that the Grizzlies signed Parsons to this massive contract. He was coming off a 2015-16 season that saw the forward average less than 14 points per game with the Dallas Mavericks. Since then, it’s been an unmitigated disaster. Parsons, 30, has played in a grand total of 84 games in nearly three seasons with Memphis — averaging a cool 6.7 points per game in the process. This season alone, Memphis has paid him a cool $36,519.00 per point scored. How fun. It’s not that Johnson can’t be a good player. He came up through the G-League and other avenues to make a solid career of this. Rather, it’s all about the leap of faith his former Miami Heat team took by offering Johnson this massive deal back in July of 2016. This came after Johnson averaged all of 8.7 points per game the previous season. Now a member of the Suns following a mid-season trade from Miami, Johnson is shooting just 37 percent from the field. He’s nothing more than a mid-tier bench option on a good team. Despite this, the kid is earning $12.5 million per season on a deal that runs through the 2019-20 campaign. 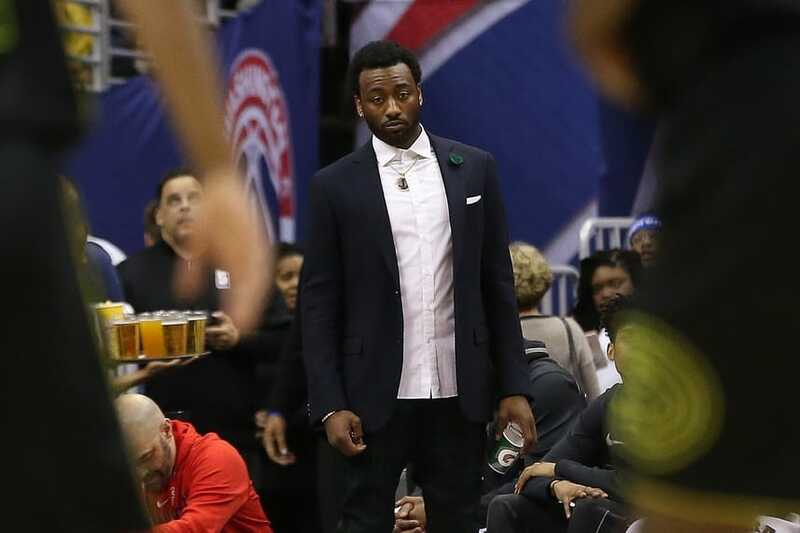 Months after signing the fifth-richest contract in NBA history, Wall found himself sidelined to a ruptured Achilles. As we saw with DeMarcus Cousins last season, that’s a hard injury to come back from. Given Wall won’t play another full campaign until his Age-30 season, this is magnified even further. What’s so devastating from a Wizards perspective is that this team wasn’t even a contender with Wall in the mix. Given the injury, it’s almost impossible to trade him and start anew. That leaves 2018 All-Star Bradley Beal as the team’s top trade asset. Talk about going in backwards. His off-court drama aside, the $82 million deal Cleveland signed Thompson to at the behest of one LeBron James back in October of 2015 has been a complete and utter disaster. We fully understand that the idea was to keep a championship core together. But much like Kevin Love, Thompson’s contract now acts as an albatross for a rebuilding Cavaliers team. The 28-year-old center is set to count $18.54 million against the cap in 2019-20. While he’s averaging a solid 11.5 points and 11.1 rebounds per game, it simply has not been worth it for Cleveland. The good news? Thompson’s soon-to-be expiring contract could end up being a tradeable commodity this summer. Minnesota is yet another team that took a leap of faith for no real reason. The Wolves signed this Senegal native to an absurd contract averaging out to $15.7 million back in October of 2016. He was just beginning a season that saw the big man average 10.0 points and 7.9 rebounds. It’s been downhill since. Dieng is averaging just north of 5.0 points in 12.6 minutes this season. It led to Minnesota failing in an attempt to trade him for pennies on the dollar. One must not look further than this deal to realize why the Wolves continue to be pretenders out west.